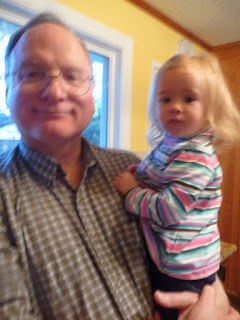 Readers, this is Uncle Woody and our favorite little girl, Haylie. Uncle Woody, the Readers. Woody is tops as far as uncles are concerned. We used go to Marriott’s Great America every summer and ride all the rollercoasters–sometimes over and over. One summer we rode the Tidal Wave 10 times in a row. It was so rad. After my aunt Anne and Woody got married, Anne talked him into taking a cooking course. He agreed, and signed up for Chinese Cooking. He began perfecting his chow mein and potstickers.It was around this time that my grandparents began hosting Chinese grad students. It was a great deal. They got free lodging and a new American family, Nana and Boppa had someone to help them around the house, I got some Chinese cousins and Woody got some cooking tutors. It worked out beautifully for everyone.Let’s start with our appetizer, potstickers! 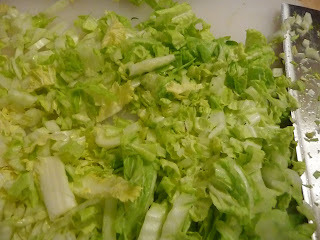 Cut the Napa cabbage pretty small. And here’s a good trick. Put the chopped up cabbage in a kitchen towel, wrap it up and give it a good sqeeeeeze. Quite a bit of liquid will come out. 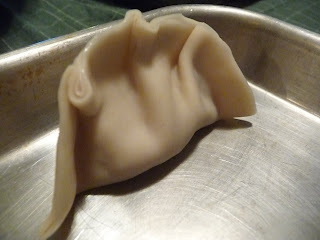 Less water to sog up your potstickers. 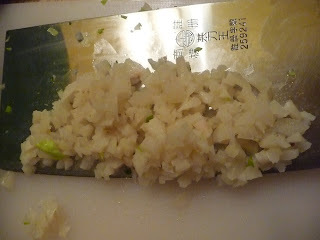 Finely chop the ginger, water chestnuts, and scallions. 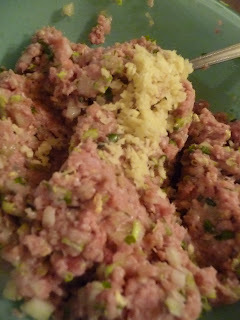 Add to the ground pork. This picture is actually ground turkey. 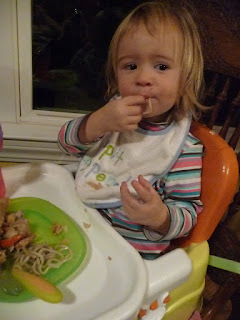 My darling cousin doesn’t eat pork, so we made them with turkey. It was fine, but the pork is better. You can also use half pork and half shrimp. Yum. 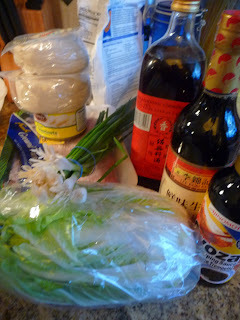 Add sesame oil, soy sauce, sherry and a little salt. Mix thoroughly. 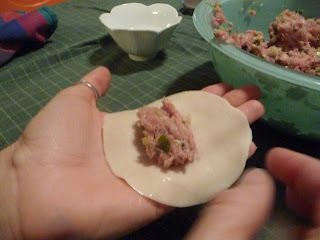 Put a spoonful of the meat mixture in the center of a prepared round wonton wrapper. 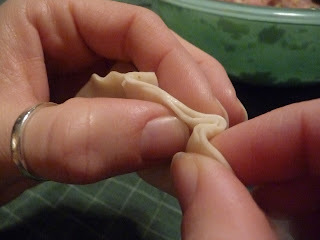 Dot the edges with a little water, and pinch them together, making little folds as you go. Push them down a little when you set them down so they’ll stand up by themselves. You can curve them a bit too, so they’re slightly crescent-shaped. You can make a ton of these, freeze them on the tray like this, then put them in a freezer bag to cook later if you want. In a saute pan, heat 1-2 Tbsp peanut or vegetable oil over medium-high heat. Fill the pan with the dumplings. You can squeeze them in pretty tightly. Cook until the bottoms are browned. Add about a 1/2 cup of water. Cover and cook until the water is evaporated and the filling is cooked through. Add another Tbsp of oil and fry for another minute. Take the dumplings and set aside. You can keep them warm in the oven while you cook any remaining potstickers. 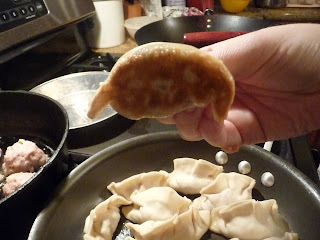 Serve with purchased Gyoza sauce, homemade Gyoza sauce, or just sweet vinegar and soy sauce. Even babies like them! Place a spoonful of filling on the center of a wrapper. Fold over, dot the edges with a little water and press the edges together to seal. Crimp the edges as you go. 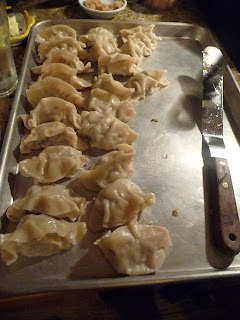 Flatten the bottoms of the dumplings as you set them down, so they will sit up. 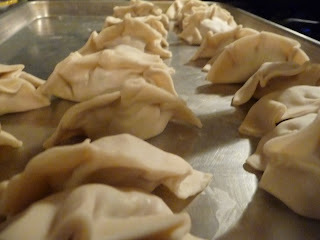 Bend the dumplings slightly so that they are crescent-shaped. 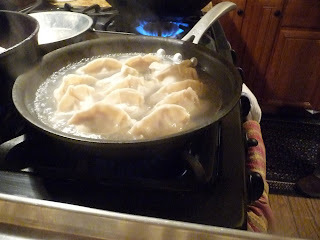 When all of the dumplings are filled, heat 1-2 Tbsp peanut or vegetable oil in a heavy saucepan over medium-high heat. 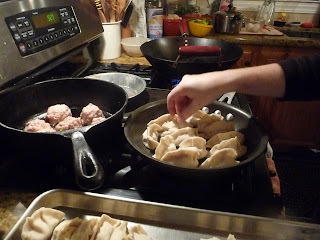 Place the dumplings in the pan and cook until they are browned on the bottom. Add 1/2 cup water. Cover the pan and let cook until the water is evaporated and the filling is cooked through. Add a little more oil and fry for a minute. Remove from pan and keep warm in the oven while you finish cooking the rest. 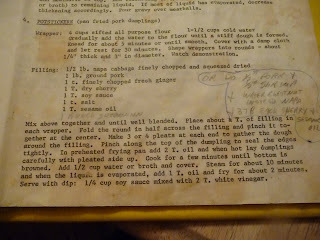 Serve with gyoza sauce or just soy and vinegar.